An assumed increase in life expectancy is the largest factor in a projected deterioration in Social Security's finances, according to the latest Social Security Trustee's report. The shortfall expressed as a share of payroll over the program's planning horizon is 2.22 percent, compared with 1.92 percent in the 2010 report. Expressed in dollar terms, the projected shortfall over the 75-year planning horizon is $6.5 trillion or 0.7 percent of GDP. By comparison, the projected shortfall in the Medicare program is equal to 0.25 percent of GDP over the program's planning period or $2.3 trillion. 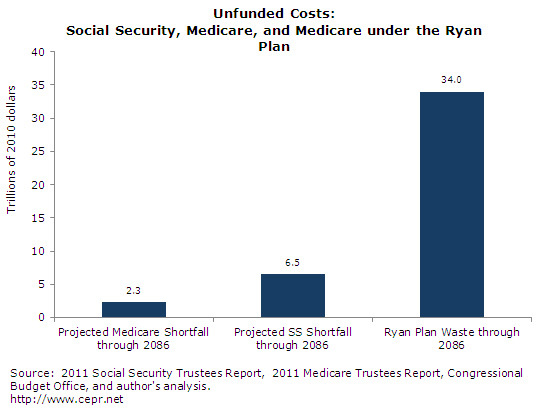 The Congressional Budget Office's assessment of the Ryan plan endorsed by the GOP implied that it would increase the cost to the country of buying Medicare-equivalent policies by more than $34 trillion over the program's 75-year planning period, in addition to transferring $5 trillion in costs from the government to seniors. For more information, see our latest Social Security Byte.